Three popular PAW Patrol DVDs are coming to stores in one special set, PAW Patrol: PAWsome Collection, available on February 5. Providing hours of fun-filled adventures with Ryder and the pups, the collection repackages PAW Patrol: Sports Day, PAW Patrol: Meet Everest and PAW Patrol: Marshall and Chase on the Case in one fur-filled collection. 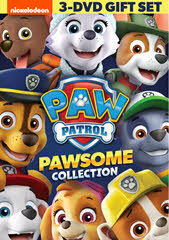 Produced by Nickelodeon Home Entertainment and distributed by Paramount Home Media Distribution, PAW Patrol: PAWsome Collection will be available on DVD February 5, 2019 for the suggested retail price of $27.99.